It's sweater weather, which means that its finally hot coffee weather! I've rounded up my favorite coffee shops in Nashville with a little blurb about each one so you can see why they are special. It's hard to pick a coffee shop to go to in a city because there's so much choices. These three are my absolute favorites in Nash, and I have a hard time thinking I'll ever get sick of them! Steadfast Coffee: This little gem is hidden away on a side street in Germantown. They have a small food menu and delicious pastries, but most importantly they have a butterscotch latte that is to die for. Their mochas are also insane. I love how they serve their hot drinks in glass! The inside is really clean and modern, and is such a great study or meeting spot! But... what makes Steadfast my absolute fave is its outdoor seating! There are some hightop stools against the windows, but down a small set of stairs there are three bigger washed-wood tables under the shade of a few trees. Come here in the early morning or late afternoon and it's really one of the most peaceful places I've found in the city. CREMA: Ohhhh, how I love your blueberry muffins. Seriously, one of the best I've ever had, and definitely the best I've had in Nashville. I don't do dairy milk, and CREMA has an almond-coconut blend which makes all their drinks even better. This shop is always really busy and full of life. I love bringing my computer here and getting work done because it feels like that's what everyone else in there is doing - productivity at its finest! Nothing like a bunch of caffeinated self-motivators to get you rollin'! Milk & Honey: I went here for the first time last week, but it genuinely has earned it's place in my top three. I got their iced almond milk caramel macchiato and I'm obsessed. It's that good. Coolest part about this place - there's a walk up to-go window so you don't have to wait in the busy line inside! 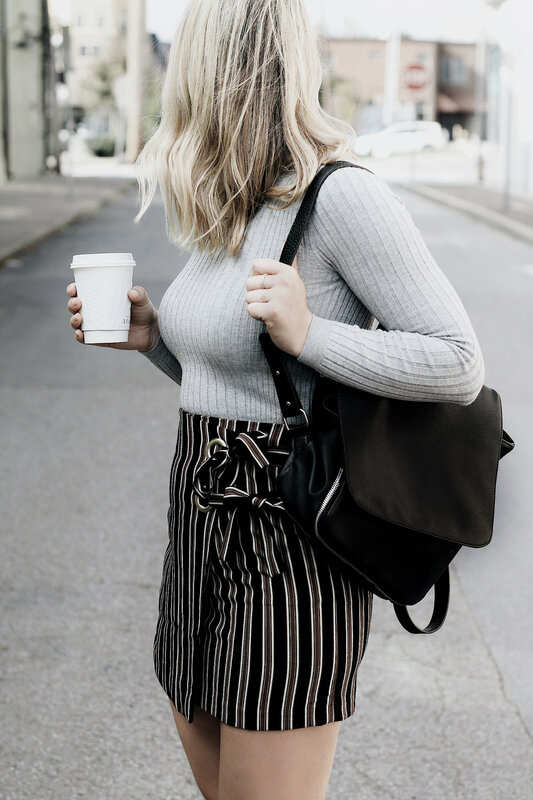 I love me some coffee and I know that a lot of my followers do too, so I hope this list will help you out next time you need a caffeine fix! Now, let's talk clothes. This skirt from Urban Outfitters is a dream. The material is so slinky and soft and although it's form fitting it really is comfortable. I paired it with a ribbed turtle neck sweater and loved the neutral tones together! Everything I'm wearing is Urban Outfitters and I've linked it all below! These booties are on sale for only $59! They are a perfect fall staple. Have an amazing Sunday, babes!